Propper International™ and Digital Concealment Systems are proud to announce the Spring 2011 launch of the new A-TACS® ACU. A-TACS represents a radical step forward in the science of concealment technology. The patented A-TACS process replaces digital square pixels with small organically shaped pixels, removing all 90-degree angles to create a more natural appearance. Additionally, the organic pixels are segmented into larger groupings organized within the pattern, creating a unique “pattern within a pattern” concept that enables A-TACS to conceal the operator more effectively at greater distances than previously possible. The pattern also features a greater range of inter-mingled natural colors for enhanced concealment. The base color is a neutral tan, designed to blend effortlessly in open, rocky or arid environments. The Propper A-TACS ACU are sewn to military specifications and made from 65/35 poly/cotton ripstop fabric for maximum durability. 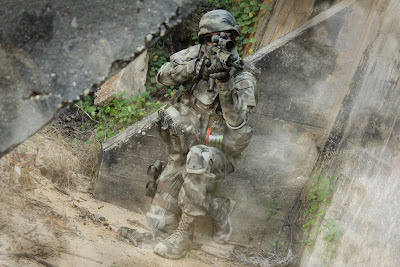 The A-TACS ACU is among the most anticipated A-TACS products launching worldwide and will serve as the core component of the product line, which includes boots from DannerÒ, packs and nylon kit from Tactical Assault Gear™, single or dual point gun slings from Blue Force Gear™, and weapons and optics systems from Remington, Bushmaster and Bushnell. This broad collection of introductory products represents the first full head-to-toe concealment system offering to tactical professionals in the U.S.
Propper will advance the A-TACS product line with boonie hats and combat shirts. These items will be available for purchase from Propper authorized dealers. For more information on Propper A-TACS ACUs, contact info@a-tacs.com. Since 1967, Propper has outfitted the United States armed forces, law enforcement professionals and first responders with only the highest quality apparel. Propper is a leading manufacturer for the Department of Defense and has produced more than 75 million garments for the U.S. Military. Propper garments are extremely durable, comfortable and functional in the field. For more information, visit www.propper.com." For those A-TACS fans out there that have been waiting for a uniform to come out, your prayers have been answered. It will be interesting to see what organizations and groups pick up and this and make the move to the A-TACS pattern, any predictions?